Spiro Reports allows you to quickly search for specific records. The Search box in the toolbar can be used to locate records in the Tabular View that matches the keyword that you specify. Type the keyword in the search box and press Enter. All the records containing the specified keyword will be filtered and displayed as shown below. The Search option will search the data across all the columns. Spiro Reports allows you to dynamically filter the tabular view to display only certain rows based on a filter criteria. You can filter a column depending on its data type. Spiro Reports offer various filtering options to filter your data, for example: filters based on specific numeric ranges, date ranges, individual values etc. You can apply filters for multiple columns at a time (to know more refer Filtering). Click on the Filter button on the toolbar and select the filter that you wish to apply for each column from the drop down as shown below. Click Apply to apply the filter and Save to save the filter with a name. To delete a filter, click on the Filter button and then click on the delete icon next to the filter name. The filter that you create is applicable only to you (the user who creates the tabular view). It does not apply when you share the report. However the shared user can create his/her own set of filters. You cannot group the data once the filter is applied. In Spiro Reports, the sort option in a tabular view is similar to the one in a table (to learn more refer Sorting a Table). Sort Ascending - Sorts text data in ascending alphabetical order (A to Z), numbers from smallest to largest (0-9) and dates from oldest to latest. Sort Descending - Sorts text data in descending alphabetical order (Z to A), numbers from largest to smallest (9-0) and dates from latest to oldest. Remove Sorting - Clears the applied sorting. 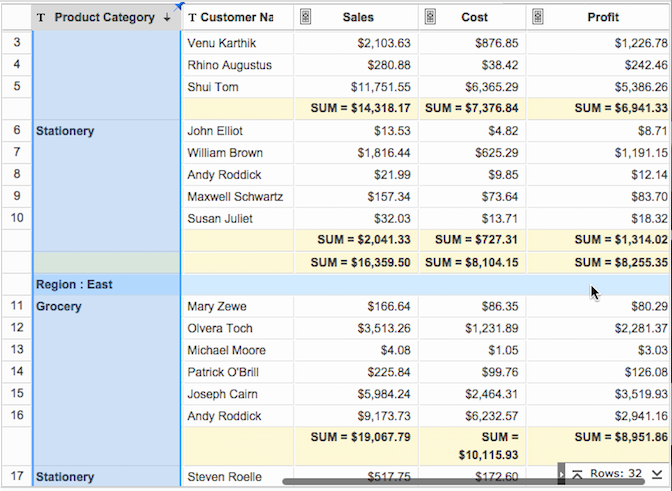 Spiro Reports allows you to show/hide columns in a tabular view. Click More button on the toolbar and select Show/Hide Columns. In the Show/Hide/Reorder Column that opens you can show/hide the columns by selecting/unselecting the check boxes next to the column names. You can also reorder the columns in this dialog, select the column and click on the up or down arrow to reorder the column. When you create a tabular view, by default all the columns will get selected, in case you wish to show/hide columns you can use this feature. When you apply this feature and share the report, only the selected columns will be visible initially. However the shared user can change this setting by selecting More>Show/Hide Columns. The Freeze Column option allows you to keep specific columns always visible in the tabular view even when you scroll horizontally across the screen, similar to a table. Refer to the topic Freeze Columns to know more. Select the column and click More > Freeze Column. To Unfreeze the column click the pin icon on the top right corner of the column. 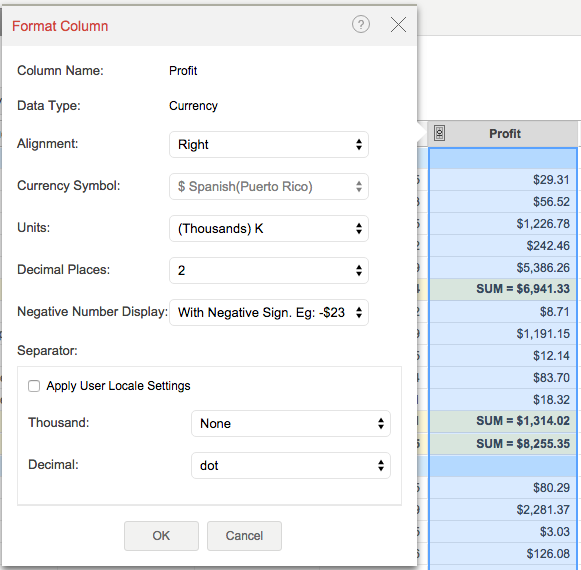 Spiro Reports allows you to reorder or resize the columns in a tabular view by dragging the column. You can also do the same by selecting More > Show/Hide Columns. Spiro Reports offer options to change the format of a column like alignment, decimal places, date formats, currency symbol etc., depending on its data type. Using these options you can choose how you would like to have your column data displayed in this view. Select the column to format by clicking on the header. Click Format -> Format Column option from the toolbar or right-click and then select Format Column option from the pop up menu. The Format Column dialog box with available options for formatting the column will open. Select the necessary formatting options in the dialog box and then click OK.
Formatting options provided in the dialog box differ based on the data type of the selected column. Refer to Format a Column section in this help documentation to know more about the formatting options. Conditional formatting feature allows you to highlight cells in a column with different background and font colors based on a condition. You have to specify the required conditions/criteria for formatting. When data in a cell meets the condition, Spiro Reports applies the corresponding formatting style that you have specified. 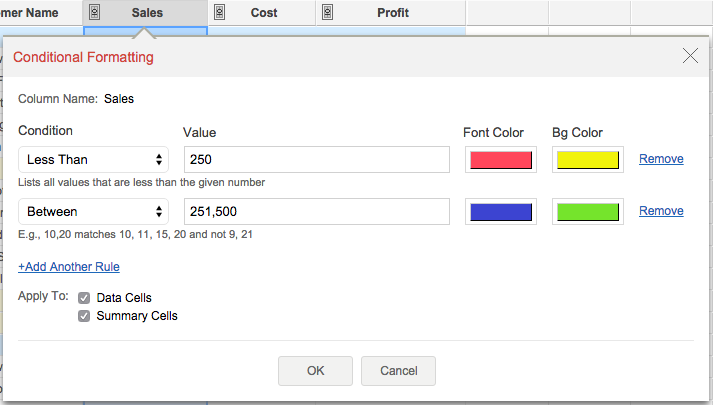 Click Format -> Conditional Formatting option from the toolbar. The Conditional Formatting dialog will open. Data cells- These are the cells that contain your orginal data. Summary cells- These cells contain the summarized data. All the cells that meet the condition will be formatted accordingly. Spiro Reports allows you to export the tabular view that you have created into various file formats like CSV, PDF, XLS or HTML. Open the tabular view that you would like to export. Click Export icon in the toolbar. CSV - Exports the underlying data of the tabular view as a Comma Separated Value (CSV) file. PDF - Exports the view in Portable Document Format (PDF) file format. HTML - Exports the view in HTML file format. Excel (XLS)- Exports the underlying data of the tabular view as a Excel file. In the Export: Settings window that opens, set the required options and then click Export button at the bottom. In Spiro Reports you can easily share the tabular view, which you have created, to other users. Open the tabular view that you wish to share. Click Share > Share this View to New Users in the toolbar. Specify the Email Addresses of the users to whom you wish to share and click Next. Grant the required permissions to the users for the views selected and click Next. Specify the Filter Criteria if needed and then click Next. Customize the invitation mail and click Send. For shared users Share option will be enabled only when the Administrator has provided permission. Refer to the topic Sharing and Collaboration to know how to share a tabular view. Spiro Reports allows you to publish the tabular view that you have created, into your websites/blogs. Spiro Reports also allows you to set and control the access privileges provided to the users who access the tabular view. This option will be enabled only for database owners or administrators. Refer to the topic Options to know how to publish a tabular view.